Director of Financial Aid Jenifer Achan sits and paints among other guests participating in the activity. 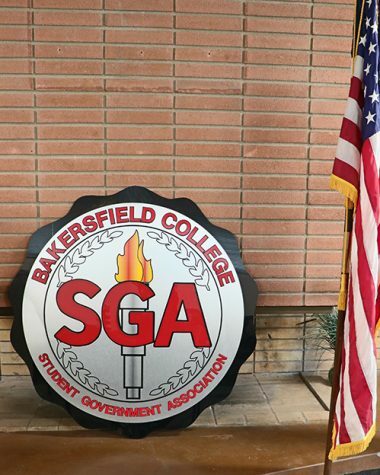 The “Pop Goes the Easel” event held in the cafeteria on Oct. 9 saw 21 members of Bakersfield College and the community in attendance. The BCSGA Scholarship Program fundraising event was priced at $30 per person and the cost covered art supplies, paint and refreshments. 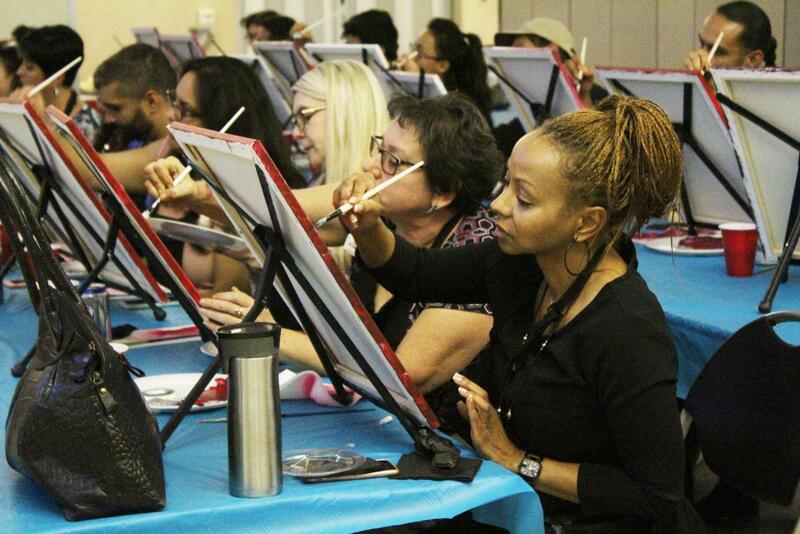 Two rows of tables and chairs were set up with easels and canvases, black, red, white and gray paint, brushes and water to rinse the brushes between uses. Guests helped themselves to a buffet of hot wings, quesadillas, fruit, assorted sauces and an array of cooled beverages before the painting session began. The host instructor for the evening was Lisa Ritter, with assistant Patricia White, from Brush & Blush Easel Events who instructed guests on how to paint a knight helmet and shield inspired by BC. Ritter greeted the audience and said she insisted that the participants grab food as she deemed it important for the painting process before they began. She then took time to explain what the painting activity would be like and emphasized throughout the affair that even though there was a set painting the guests were to follow, creative freedom was “absolutely” allowed. Ritter, a BC alumnus, shared some of her memories and experiences as well as observations on how the school had changed or stayed the same. “I attended BC 20 or plus years ago,” said the former journalism major. “I won’t say exactly when, but I can say that [the cafeteria] still smells the same.” This was met with laughs from the audience, a seemingly common occurrence during the event. Callaryah Flowers stands to paint her version of the BC knight helmet and shield. One guest in attendance who seemed to be having a good time was BC student Callaryah Flowers, who was not new to art, stating Leonid Afremov as one of her preferred artist, but did share that it was her first time attending a painting event on campus. “It’s my first painting event at BC. I thought it would be fun. I’m better at watercolor, I’ve worked with acrylic before but I prefer watercolor,” said Flowers as she stood to paint. People would laugh as they sang along to the ’80s music playlist playing in the background or at the progress in theirs and their neighbors’ paintings. Most of the guests admitted to having little to no experience painting but said that they were eager to try and were enjoying themselves. 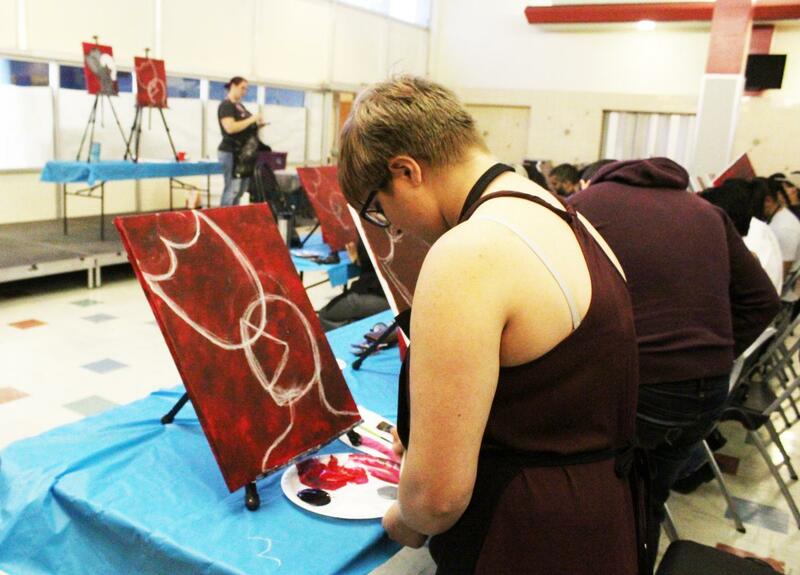 The “Pop Goes the Easel” fundraiser was held from 6-8 p.m. in the BC cafeteria by the Office of Student Life. Of the proceeds raised, approximately $600, all are to be implemented into the BCSGA Scholarship Program.